9 down, 41 to go! 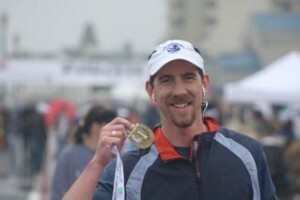 Rolled into a whirlwind trip back east, I completed the NJ Marathon in Long Branch on Sunday, May 3rd. If you’ve been following along, you know that I wasn’t exactly well-trained and prepared for this one. Here’s how it all went down. Thursday, April 30th – rode in an RV for 14 hours from PA to NC with father-in-law and Garrett, while Bethany drove the truck with her mom and Gillian. Lots of stops for kiddos made for a long trip, but it was good to learn that our kids could handle a long road-trip like this. Friday, May 1st – Lucinda & Jeff’s wedding at Lake Norman, NC. A beautiful wedding, with Gillian as a flowergirl, and a huge candy bar at the reception that Garrett enjoyed all…night…long. Saturday, May 2nd – after a brunch with Lucinda & Jeff and family, we piled into the truck and drove 10 hours from NC to my parents’ house in NJ. Again, glad to know that our kids are fully capable of making a long road-trip…they did really well. We made it to Marlton, NJ around midnight, and I laid out my stuff for the marathon the next morning. 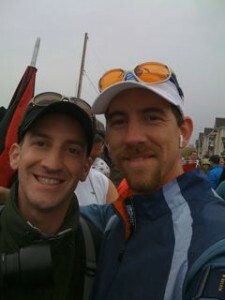 My brother Scott offered to get up early and drive me to the marathon an hour and a half away. We agreed to leave the house at 5am, and I hit the sack for a 4-hr snooze. 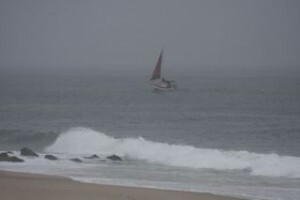 Sunday, May 3rd – we left the house around 5:15, had smooth sailing until we got to Long Branch, where marathon traffic was badly backed up on the main access into town. Thanks to Scott’s GPS, we made our own detour and found another way into town, and managed to find parking right at race headquarters, easy walking distance from the start. I had arranged for a race-morning packet-pickup through a charity organization called Bosco’s Buddies. So, I was able to get my bib and chip and goodies, and was at the start area with 20-minutes to spare. It was chilly and damp, with a drizzly mist and fog, but the energy and excitement was clear. There was a good crowd of runners and spectators, and lots of good vibes going around while everyone waited for the start. And waited. And waited. Then an announcement: local police were dealing with an accident on the main access road into town, and lots of runners were still stuck in traffic. The start would be delayed by 30-minutes. Groans and expletives were heard all around. It was cold, and we were just getting wetter and colder by the minute. Everyone just wanted to get moving. I was able to find a portable generator to stand next to, the exhaust of which kept my legs fairly warm. During the wait, I ripped a piece off of a plastic bag, and used it to cover the exposed end of my iPhone (the rest of it was protected by the arm-band case, but I didn’t want any rain to get into the top). 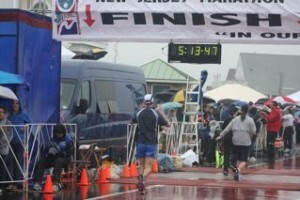 I also chatted with lots of folks around me: several first-timers just hoping to finish, a guy who had run every NJ Marathon since the start (one of only a few people who’ve done this), and several folks from other countries (UK, Germany, Romania…just in the 10-foot radius near me!). Finally, we were given the green light, and the awkward walk/trot began advancing us all across the starting line. I hit start on my watch as I crossed the mat, and tried to move over towards the left side, where I knew Scott would be hanging out around the first turn. 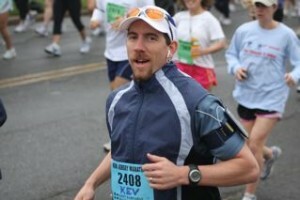 While negotiating a “flow-crossing”, I somehow caught a sharp elbow to my forearm from a runner in front of me. He had stopped suddenly to avoid a puddle, causing plenty of disgruntlement behind him, as another runner bumped into the back of me and ran up the back of my leg. I was anxious for the crowd to thin out. Just before rounding the first turn a few minutes into the race, I looked at my watch. It said I had run 7.1 miles already! Crap! I forgot to reset it after my last run of 6.8 miles! I reset it quickly, knowing that it would screw up my mile-markers and data tracking, but figured I could just adjust for the 0.3 miles lost when I reviewed the data afterwards. Just then, I rounded the bend and saw Scott standing high atop something, camera in hand. I quickly realized how great it was going to be to have him there to cheer me on, and I knew that Bethany and Ryan would be on their way there soon too. It was gonna be a good day. 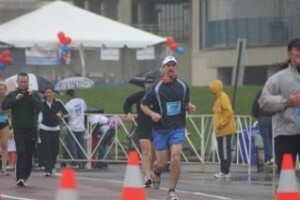 Early in the race, I fell into pace with two young women who asked me where I was from. Upon hearing “Colorado”, their response of “what are you doing out here?” promtped several minutes of friendly conversation about where we each grew up, jobs, families, ets. One of them has a son whose birthday is 3 days later than Garrett’s, and a daughter whose birthday is 2 days earlier than Gillian’s. We shared stories about the challenges of training for a marathon with two young kids, and how we were both feeling very undertrained. 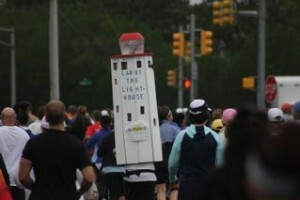 She, however, decided to adjust her registration to just do the half marathon. I began to wonder if she wasn’t the smarter one of the two of us, especially as I was still feeling quite stiff from all the traveling. As the crowd thinned out, I picked my head up more and more, forcing myself to take in the ocean views and trying to notice what I was passing. This course was a two-loop course, so I really wanted to take advantage of being able to recognize where I was on the course when I got around to the second loop. We ran through a wide variety of neighborhoods and communities. I was actually struck by how quickly they changed. One minute, I’d be running down a back alley between smallish homes that were not very well-kept, only to suddenly find myself in a neighborhood of million-dollar estates around the corner. Next, I’d be running past a cutesy row of businesses and coffee shops, before suddenly finding myself cruising by some kind of industrial facility with a tall fence topped with barbed-wire. In the residential areas, spectators were spotty, but steady. Those who were out were really trying hard to have an impact greater than their small size. One home had professional DJ equipment set up to play music from their front porch (I especially liked the house that was playing music from Rocky). Another home had an elderly couple on the porch banging a few pots with wooden spoons, and dancing around merrily. Each time, I tried to applaud for them too, and express my appreciation for their support. I soon had a group of runners around me who would all join in my efforts to thank volunteers and supporters as we passed. We began to offer them the encouragement that we so often hear, “Looking good! Keep it up!”, or even “You’re looking strong, keep up that pace!”. The spectators who heard that from us as we were running looked extremely puzzled, and amused at our dorkiness…which ultimately served to amuse us too…so we kept doing it, and more and more people joined in around us. For a while, it seemed we had a group who was in competition with the spectators to see who could be the loudest and most supportive of the others. Goofy…but fun. Several times my iPhone would ring, and I’d answer the call with my earbuds, enjoying the combo of iPod and cell phone in one device. 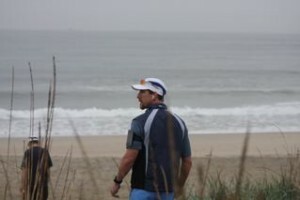 Most often, it was Scott calling to see how I was doing, and report on his next location where I’d see him. 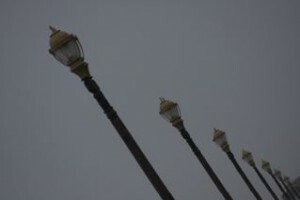 Especially in the rain, it was nice to not have to fiddle around to switch functions between iPod and phone. The iPhone does this so seamlessly, it’s great for long runs. I had my music on, although it was barely audible for most of the run. I like to be able to hear everything that’s going on around me, and really get the whole experience…but I also enjoyed a little music during the lonely stretches in the second loop after all the half-marathoners were gone, and the spectators were even more spread out. The experience changed drastically at the halfway point. Like a false summit on a climb, passing through the finish area that was packed with spectators and half-marathon finishers reveling in their completion was a bit of a tease to say the least. The energy was great, but it just made the second-loop feel all the more quiet after that. There were clearly many more half-marathoners out there than full-marathoners. Well, that and the fact that I was mid-pack to back-of-the-pack among full-marathoners made for a much more solitary second-loop. Thankfully, this is just about the time that Ryan and Bethany arrived! Ryan called me to see where I was, and chatted briefly about where they would try to intercept me. We said goodbye until then, but he didn’t hang up his phone. Enjoying the company, I didn’t hang up mine either. I just half-way listened to them trying to find parking, asking volunteers about how to get to where they wanted to go, sharing their map with another spectator, etc. 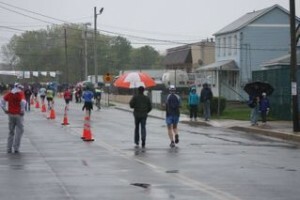 About mile 18, the rain picked up in earnest. Although I was already pretty wet on the surface, it was the first time I felt that my socks and shoes were now soaked too. No need to avoid puddles now, I thought to myself…as I stomped through an ankle-deep “road-pond”. 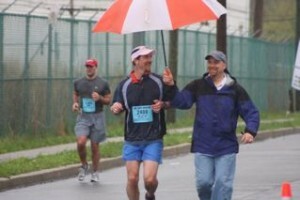 Mile 19, I was treated to the sight of Ryan doing his best Mary Poppins impersonation. Prancing and dancing with the umbrella high over his head to get my attention. I couldn’t help but smile. Bethany and Scott were there too, and it was nice to see everyone together and get their encouragement. Ryan ran along with me for a bit, giving me a brief respite from the rain with his umbrella. Then Scott traded off and ran with me for a bit, as the wind kicked up and suddenly made me feel quite cold for the first time. I had been running somewhere between the 4:45 pace group and the 5:00 pace group, kind of hoping to finish under 5, but really just looking to keep it relaxed and conservative. Since I hadn’t trained properly, I didn’t want to risk injury. That being said, the 5hr pace group leader was a guy in a silver tuxedo…and I just really didn’t want to get beat by him. 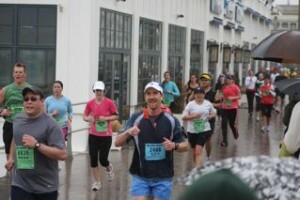 As if the law of attraction manifested that fear, I got a nasty cramp in my left quad at mile 24. Slowing to a walk, I then got a cramp in my left calf too. I walked it out over the next mile, and the cold finally motivated me to start running again…just as the 5hr tuxedo guy came trotting by. Argh. I just didn’t have it in me to stay ahead of him, so I had to just let go of that. He finished about 6 or 7 minutes ahead of me. My official finish time = 5:11:00, about 46 minutes slower than my PR, but one of the most fun long, slow training runs I’ve done in a while! After shivering in the finish tent waiting for them to put out more hot soup, I headed back to race headquarters to get my post-race massage and change into some dry clothes. I’m still processing the whole experience, which was a unique one for me in many ways. I’ll attempt to extract my “lessons learned” in another post. 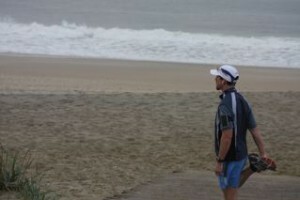 Now, recovery, and recalculating this year’s marathon training calendar to prep for a fall marathon or two. Wow, this was a long post. Thanks for reading! Nice recap Kev! Despite the rain, it was still fun hanging out with you. Hopefully, I’ll run another with you sometime. 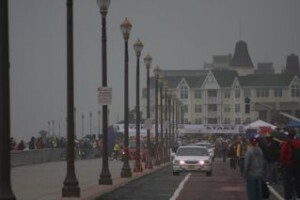 For spectators, the NJ Marathon’s double loop is nice. It guarantees you 4 spots to see your runner that are within about 2 blocks of each other. There are also lots of little shops and breakfast places near the boardwalk while you’re waiting between passings. Using the satellite parking and shuttle bus worked out well for Ryan and Bethany, but I think the $5 was well worth it to park by the ballrooms (Something Resort & Spa) on the boardwalk. 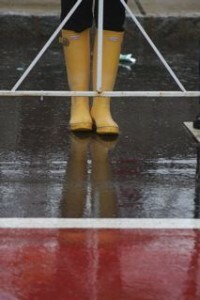 By the way, I’m glad to see I didn’t damage your camera with all the rain! So when is number 10? 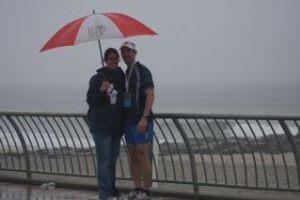 Enjoyed reading about the marathon and sorry we weren’t there, but I must say, we had a good time watching the kids while y’all were out playing in the rain down the shore! Since you have a “few” more to go, we should catch up with you at a future race.